210 Landing Gear Rigging (K thru R models) Part 1-Preparation | Tennessee Aircraft Services, Inc. I average about one call per week from owners and mechanics asking questions about Cessna 210 landing gear problems or rigging troubles. Most of these questions stem from a lack of understanding of how the system functions and the typical failure points that need to be addressed. In fairness to the vast majority of shops/mechanics, it’s just not cost effective for them to become 210 landing gear experts when they only maintain one or two of these planes. For that reason, it seems a good idea to attempt an exhaustive review of the 210 landing gear rigging procedure. Due to the many versions of the 210 undercarriage system, this article will need to be in multiple parts. I don’t know how many parts yet, but I will be limiting the discussion to the round gear leg models (1970 through 1986). Even with the multiple renditions of the system, there are many common issues that need attention in preparation for rigging. Ignoring these could send one down the road of endless frustration and unreliable landing gear operation. The first order of business is to read through the landing gear system description in the service manual specific to the model 210 that one is planning to rig. One must first get a good overview of the sequence of events during retraction and extension of the undercarriage. This sequence may seem obvious, but reading through the maintenance manual version of the operation is more revealing than the description in the Pilot’s Operating Handbook or Owner’s Manual. Having the main gear downlock gauge set, Cessna part number SE960, is a requirement for proper rigging of the main gear down locks. There’s no aftermarket gauges of which I’m aware and no method to create substitutes in the As of this writing, the cost for this gauge set is $563.00, and Cessna shows one in stock. Follow all premaintenance set up procedures called for in the service The belly of the plane will be suspended precariously on jacks almost two feet above the norm, so now is not the time to ignore safety precautions. When those main gear legs start swinging their weight around, you’ll find out just how sound those tall wing jacks are. 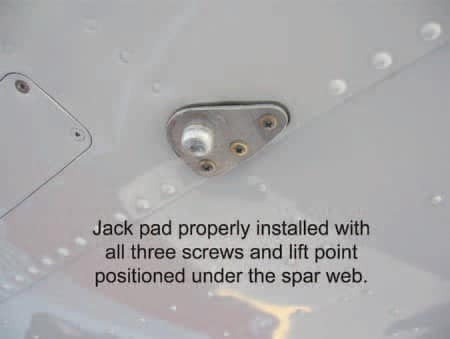 Correctly install the wing jack The jack pads have three holes located in a Murphy proof pattern. I’ve been called on to repair many wings after technicians used only two of the holes as they were sure the lift point should be in a different location than Cessna intended. For the electric systems be sure to pull and flag the gear motor circuit breaker when leaving doors open for maintenance It’s very painful to be working in the nose wheel well at the same moment someone else trips on the aircraft master switch. When the pump unexpectedly comes on, the doors close with all the efficiency of a steel bear trap. I estimate it takes at least sixty seconds for everyone to figure out what happened, stop the screaming, turn off the master switch and pump the emergency gear handle enough times to release the system pressure and extract the poor critter that’s caught in the trap. Also for the electric systems, use of an external auxiliary power source during gear operation is a must. This power supply should be capable of at least 50 amps continuous load. There are some functions of the electric power pack that will not occur properly if the system voltage is below about 22 volts. For want of a power supply, many man hours have been wasted chasing a problem that didn’t exist. It’s a very good idea to review all the Cessna service bulletins that might apply to the plane’s landing gear system. While bulletins aren’t FAA required for CFR Part 91 operated aircraft, they are an excellent source for hints about problem The easiest place to find these is at www.cessnasupport.com. This is a free site produced by Cessna that every Cessna owner should access. Registration is easy. Once there, one can search for bulletins with filters to the specific aircraft serial number and level of bulletin urgency. At last check, I counted about thirty bulletins relating to the 210 gear system. 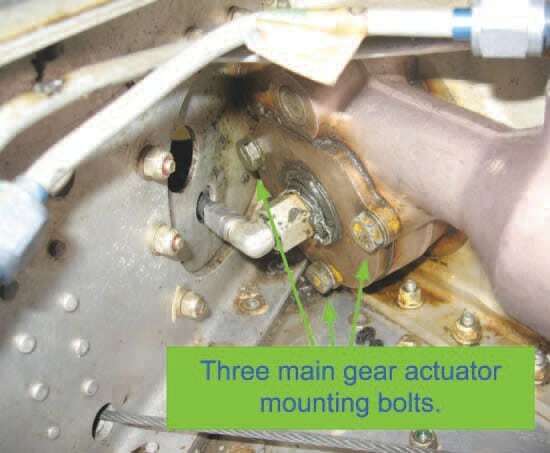 ◊ SE84-03 published January 13, 1984 calls out an improved nose gear actuator downlock spring Installing this new style part is an absolute must for every single engine retractable Cessna. The part price in 1984 was $9.78 and is now $62.50, and they show ninety-three in stock today. When the old nylon guide fails, the nose gear will retract suddenly and without warning. Typical repair efforts includes a replacement propeller, engine prop strike inspection, new nose gear doors, and structural repair costs somewhere in the $80K neighborhood. ◊ SEB95-20 published December 29, 1995 calls for nose gear downlock pin This inspection should be part of every annual inspection and especially before any work relating to the nose gear downlock. ◊ SEB94-19 published July 29, 1994 calls for inspection of the nose gear lower trunnion. This is especially important if the nose gear strut has been allowed to overextend allowing the nose tire to contact the forward portion of the nose wheel well. See my article in the December 2008 issue of the CPA magazine detailing this issue. ◊ SNL86-49 published December 12, 1986 for main gear actuator mount bolt security calls for installation of drilled head mounting bolts. This only applies to a limited serial number group but exposes the value of ensuring these bolts are checked for torque at every annual if safety wire can’t be installed. ◊ SEB01-2 published June 4, 2007 is for main gear actuator inspection and is what will need to be done if the mount bolts, referenced in SNL8649, are not kept to proper torque. Read that as lots of $$$. The entire undercarriage system should be lubricated in accordance with Section 2 of the 210 service manual. Particular attention should be paid to the nose gear downlock mechanism which requires thorough cleaning and specific dry lubricants. Having a nose gear downlock coated with paint or old dirty grease is just asking for unreliable downlock operation. 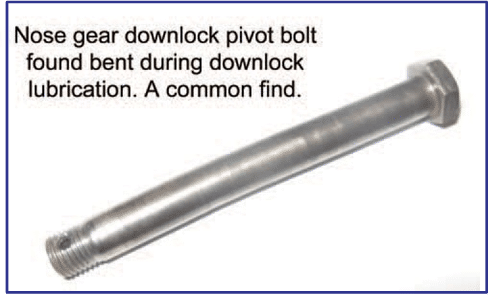 While the nose gear downlock is disassembled for lubricating, it’s a good time to inspect the condition of the downlock pivot bolt. The bolt should be thoroughly cleaned, inspected and lubricated prior to reinstallation. The maximum nose strut extension is 5 inches. If this dimension is exceeded by much, the nose tire can contact the forward part of the wheel well during gear retraction. This applies extra stress to the lower trunnion which sends you back to SEB9419. There is a hard pad mounted to the main gear saddle where the gear leg rests in the down locked position. This pad wears and/or falls off which changes the position of the gear. This inadvertent relocation effectively changes the rigging and operation of the main gear downlocks. These pads must be installed and in good condition for proper downlock adjustment. The saddle assemblies are secured with four bolts accessible through the cabin The saddle should be checked for looseness. One sure way to know the saddles are loose is that the shims have slipped out of position. This is easy to visually inspect from inside the wheel well. When the main gear retracts, they hit bumper pads mounted in the top of the wheel well. If these pads are missing (a common issue) the legs will travel too far into the well and often overshoot the uplocks. On the 210K models, this presents as the gear up light won’t illuminate unless the handle is manually tripped to the up neutral position after the gear has swung into the wells. The gear doors (if still installed) will stay open because there is no longer pressure in the system. The handle can be momentarily returned to the up position to close the doors. It may seem obvious when just talking about it, but low fluid level in the hydraulic reservoir is one of the most common problems with the Checking the fluid level should be a pilot preflight item. It’s an absolute must prior to performing checks or maintenance of the gear system. Every system has a filter that should be cleaned and inspected at every The 210K model filter is mounted on the engine side of the firewall where the pressure line from the engine driven pump connects. The electric systems have a filter mounted in the power pack accessible from inside the cabin. After all the above items are checked, the system can be operated to ensure all the components are functioning. If any part of the system or indication doesn’t operate, that will need to be addressed before rigging can begin. I know all that seems like a lot to do just for a few adjustments. The problem is that you don’t want to get four hours into rigging the system and then find some adjustment won’t cooperate. Many frustrating hours later you discover everything could have been solved just by plugging in a power cart. Many of the items listed have likely never been looked at during routine maintenance. If a mechanic isn’t in tune with the details of the 210 gear system, he/she might never notice the gear leg bumper pads are missing. Hours and hours would be spent tracking down an uplock problem that never existed. The entire round gear leg 210s are at least twenty-nine years old with the oldest now at forty-five years. It’s time to give her a good going-over. Next month we’ll actually get into the rigging process. Depending on how one counts, there are at least four distinctly different gear systems used on these planes. They do have many common points, but the devil is in the details.